Properties in Spirit Of St Louis Airport (SUS) average 4.4 out of 5 stars. Property 1: Amazing 1860's Historic Home! 1830's Luxury Brick Cottage, Cozy Fireplace, right off the Cobblestone Streets! Property 2: 1830's Luxury Brick Cottage, Cozy Fireplace, right off the Cobblestone Streets! Property 6: (55.1S) True St. Louis Experience! 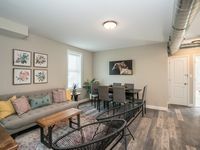 Property 9: Chic & Charming Loft Suite Near STL Zoo! 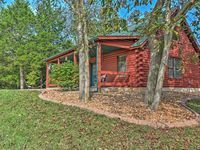 Property 10: Private Defiance Cabin on 43 Acres! Property 16: 1870's Luxury Guest Cottage, Historic Downtown St. Charles, Mo. 1790's Renovated Barn, Historic Main Street St. Charles, with 8 person Hot Tub! Property 17: 1790's Renovated Barn, Historic Main Street St. Charles, with 8 person Hot Tub! Property 18: Pet friendly--close to Purina Farms, 35 min from Saint Louis. Property 22: Charming Cottage on Main St. in Historic St. Charles! Jetted Tub, 2 Fireplaces!! Escape the city to quiet and picturesque Golden Eagle, IL.! Property 24: Escape the city to quiet and picturesque Golden Eagle, IL.! Property 25: (53.1N) Walk To Forest Park In Comfort! (53.2S) Jewel of Central Saint Louis! Property 28: (53.2S) Jewel of Central Saint Louis! Property 29: Historic home in Augusta, the heart of Missouri wine country! Property 30: Adorable Two-Person Bungaloo nestled in the cozy town of Augusta, MO! Property 31: Lake Haven--Updated Mid Century Cabin Only 35 Mins From St Louis. Perfect for your vacation stay in Historic St. Charles! Property 33: Perfect for your vacation stay in Historic St. Charles! Property 40: Quaint, Cozy Home in Dogtown! Spacious & Charming Home, Great for Families! Sleeps up to 8! Property 41: Spacious & Charming Home, Great for Families! Sleeps up to 8! (51.1S) Forest Park Gem - Zoo, Art Museum, Science Center, Muny! Property 42: (51.1S) Forest Park Gem - Zoo, Art Museum, Science Center, Muny! Property 45: NEW! Quiet St. Charles Cottage on 4 Acres of Land! Property 47: Beautiful Villa Close to All St. Louis Attractions! Property 48: (49.2W) Beauty in Central of Saint Louis!